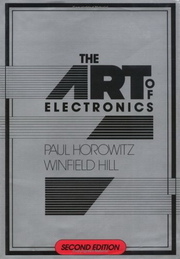 The Art of Electronics, by Paul Horowitz and Winfield Hill, is a popular textbook dealing with analog and digital electronics. The first edition was published in 1980,:xxiii and the 1989 second edition has been regularly reprinted. The Third Edition was published on April 9th, 2015. The author is accepting reports of errata and publishing them, to be corrected in future revisions. There is also a complementary text, Student Manual for The Art of Electronics by Thomas C. Hayes and Paul Horowitz. The Student Manual, while referring to the main text extensively, is designed specifically to teach electronics. It contains laboratory exercises and explanatory text supplements aimed at the student. In contrast, The Art of Electronics contains tables, equations, diagrams, and other material practitioners use for reference. ^ The 2001 pressing of the second edition (ISBN 0521370957) lists "Reprinted 1990 (twice), 1991, 1993, 1994 (twice), 1995, 1996, 1997, 1998 (twice), 1999, 2001". ^ "Art of Electronics, 3rd Edition, errata". Horowitz, Paul. April 7, 2015. This page was last edited on 8 March 2019, at 20:41 (UTC).